This front facing 3/4 length portrait shows Anna Maria Macarthur, aged 50, posed in a domestic setting, seated in a high-backed upholstered arm chair draped with a checked shawl. Mrs Macarthur is known to have been of delicate health which is certainly portrayed in this sensitive portrait. Anna Maria wears a full-skirted, light-coloured [silk] day dress with long sleeves, fitted through the upper arm to the elbow, marked with small puffs, or ‘bouffants’, full over the forearms and gathered into narrow cuffs at the wrist. The bodice of the dress is shrouded by a sheer, white-work embroidered ‘pelerine’, or capelet, topped by a small white collar with ruffled edging fastened at the neck with a small rectangular brooch, over which is laid a large blue and white [printed] scarf pinned with a large [enamelled or micro-mosaic] brooch. She wears a wedding ring on her left hand which rests in her lap over a piece of [fabric/sewing], her smoothly centre-parted brown hair dressed in rows of sausage curls over her ears, and covered with a ruffled and beribboned indoor cap of fine white fabric trimmed with artificial flowers and [stalks of wheat]. This image shows Mrs Macarthur at the height of her social position, just before financial troubles overwhelmed her husband. It was painted in the same year as the artist’s somewhat grander portrait of her mother, Anna Josepha King (ML 1192), then in residence with her daughter and son-in-law. William Nicholas (1807-1854) seems to have been the favoured portrait artist of prominent colonial families in Sydney like the Macarthurs, the Wentworths and the Kings. 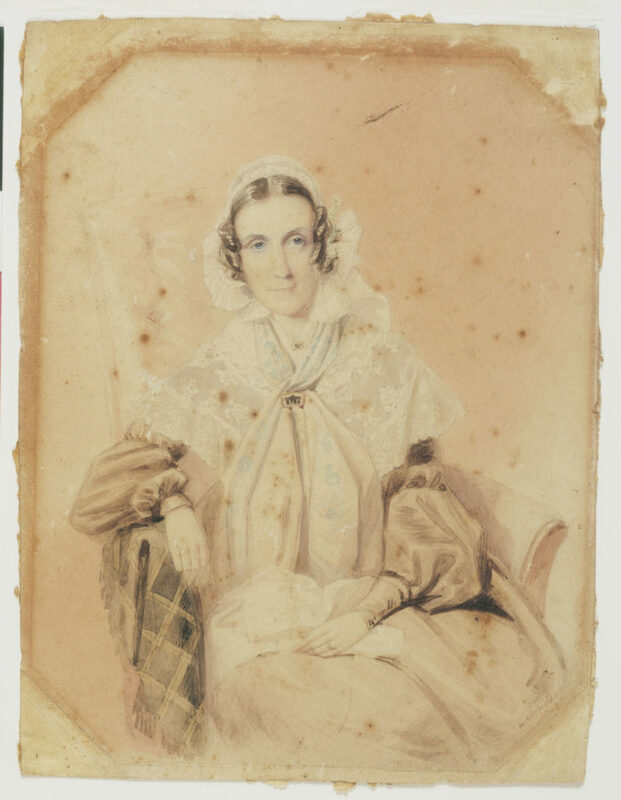 Anna Maria Macarthur, nee King (1793-1852) was the eldest daughter of Governor Philip Gidley King. She married pastoralist, politician and businessman Hannibal Hawkins Macarthur (1788-1861) in 1812. The couple settled at The Vineyard, near Parramatta, NSW, which became one of the leading houses of the colony, and raised a family of eleven children (5 sons and 6 daughters); James Campbell Macarthur (1813-1862), Elizabeth Macarthur (1815-1889), Anna Macarthur (1816-1852), Catherine Macarthur (1818-1894), Charles Macarthur (1820-1871), Mary King Macarthur (1822-1898), George Fairfowl Macarthur (1825-1890), John Alexander Macarthur (1827-1904), Emmeline Maria Macarthur (1828-1911), Arthur Hannibal Macarthur (1830-1871) and Emma Jane Macarthur (1832-1866). After her husband’s financial collapse during the late 1840s depression, the Macarthurs moved to Ipswich, Qld, where Anna died in 1852. Subject is posed in an easy chair, with a checked shawl draped over one arm suggestive of a domestic setting.